Recycling 3D Printer Plastic Waste? I’ve had 3D printers at home for about 7 months now, pretty much since my first blog post designing the 3D printed kite-board fin. Inevitably there have been plenty of failed prints, and of course piles of support material. However rather than just throw it all away I’ve actually been keeping all the waste material in a bucket I keep next to whichever printer I’m using. The image above is the result of these 7 months of 3D printing; approximately 1kg of pure ABS plastic! I’m certainly not the most environmental person, but I just can’t throw away this much perfectly usable plastic, so have put the call-out within my circles for someone with a filament extruder like the Filastruder to take it off my hands for free. 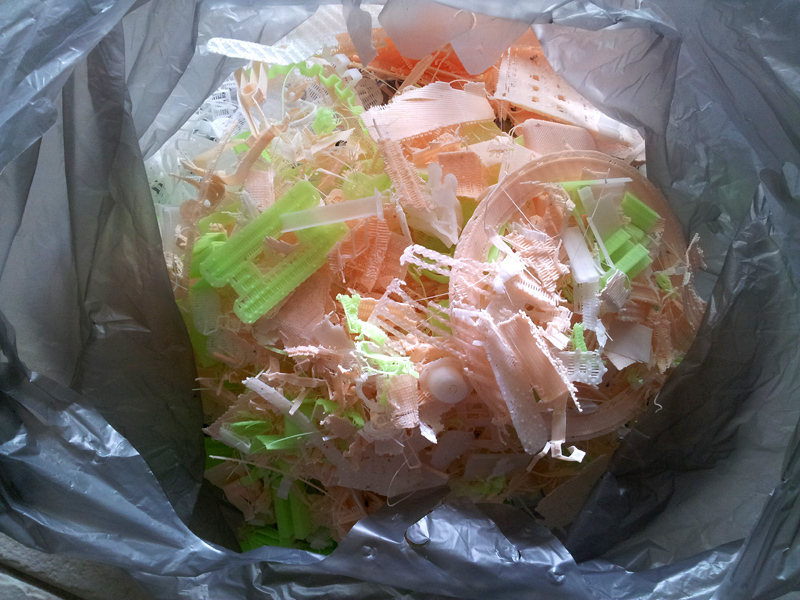 Unfortunately an extruder is not part of my ‘toy’ collection (yet) or I’d be busy shredding this bag of plastic and extruding my own home brand of multi-coloured filament! I’m not sure if anyone else has been doing a similar thing – if you own a 3D printer I’d love to know what you do with all this waste, and if you have any sort of filament extruder to recycle as much as possible. Please leave a comment with your suggestions, and I’ll post an update if I get this pile recycled by someone. Perhaps I’ll also keep an eye out for the next Kickstarter filament project! UPDATE 26/6/15: I have since found a student with an extruder to take this off my hands – hopefully a small good deed for the environment.